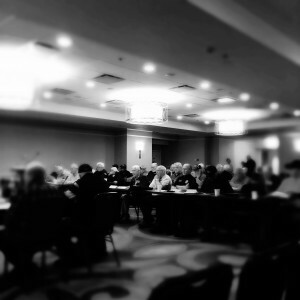 Day two of the VVA Board of Directors and Conferencen of State Chapter Presidents meeting, Silver Spring, MD. Very moving and useful. Great opportunities for oral histories here. The VVA is worrying about its longevity. Some years ago it decided to be a ‘last man standing’ organization. How long can it hold out? If the decision is made to close down, how will this be done? The VVA has assets that will have to be disposed of. But, even as discussion about this issue grows, membership numbers are increasing nationally; VVA now has 78,816 members, an all time high. 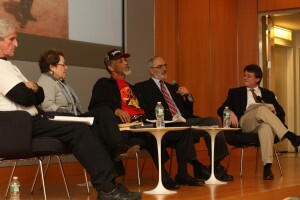 On Tuesday, November 5 I had the privilege of hosting a panel discussion at the New York Public Library. Four Vietnam veterans told their stories, two of whom, Joan Furey and Herbert Sweat, are profiled in my book Bringing It All Back Home. All four have recorded oral histories. Below is a very lightly edited version of the opening remarks I made. I’d like to begin my saying how honored I am to be here speaking with you. I want thank Alexandra Kelly, Emily Jacobson and the NYPL Outreach Services staff for inviting me, for providing us with this fabulous space in which to meet, and allowing us all to collectively honor and listen to the veterans that we have with us here tonight. My job in these first few minutes is to help establish a context for the comments that will follow. I’d like to talk for just a bit about three things: the power of listening, about oral history, and about the general, popular understanding of Vietnam veterans. We have with us 4 veterans of the American war in Vietnam; Joan Furey, who served in Vietnam as a nurse in 1969; Herbert Sweat, who served with the 173rd Airborne Brigade in 1968; Everett Cox, who served with the 245th Surveillance Airplane Company in 1969, and Earl Jacobson who served with Task Force Alpha, at the Nak-hon Pha-non Royal Thai Air Base, in Thailand. Our goal over the next hour is to listen to them; to try to slow ourselves down, and truly, deeply hear, about the meaning of war from men and women who have served our country abroad in the Vietnam War. The reasons for doing this, for tonight’s exercise in deep listening, are of course as varied as the people in the audience. I’d like to offer my own. 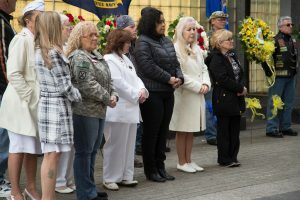 I listen, and I invite you to listen, not just out of respect for the service of the men and women in front of us — although that’s a real enough reason to do so — but also because their stories contain a series of truths — about race, about gender, about sacrifice and healing, and about the long-term meaning of military service. These truths are subjective — personal to the teller. But they are real none the less for that, and in my view, these stories and their truths help us think and learn about ourselves. For example, by listening to these veterans, we – civilians like myself — can learn about the hard choices people sometimes have to make, and that can allow us to reflect on our own lives and circumstances. 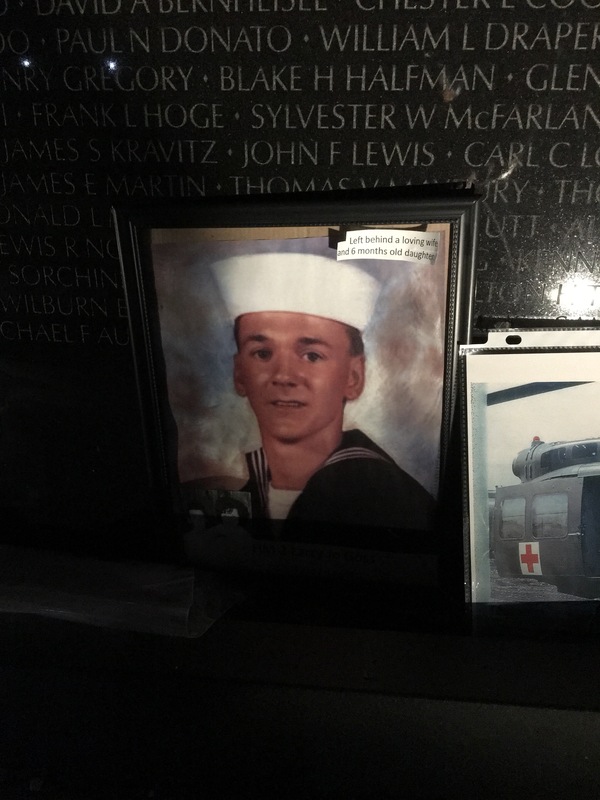 Choices made in wartime can sometimes literally have life-or-death consequences, and by listening to and understanding the choices made by veterans in war, we can place our own decisions in perspective. 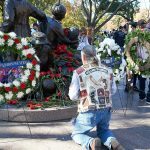 Furthermore, the stories of veterans can teach us about how people persevere in the face of adversity; how people can work to overcome the difficulties they face. This is something we can learn from, too. I’m leery of talking about the “healing” power of conversation, for talk of healing seems to me to suggest that we want injuries to somehow go away – and the injuries of war never really do. But perhaps these veterans can teach us how one works toward that goal. Maybe they can show us that healing is a journey, a process, an objective — not a thing — and help us understand their voyages – and therefore our own. This kind of listening, can, correspondingly, have a deep impact on the veterans themselves. 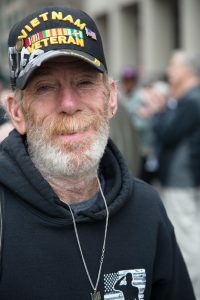 More than one of the approximately 200 veterans I spoke with in my Vietnam project told me that the our conversations allowed them to express things that they had never shared before. 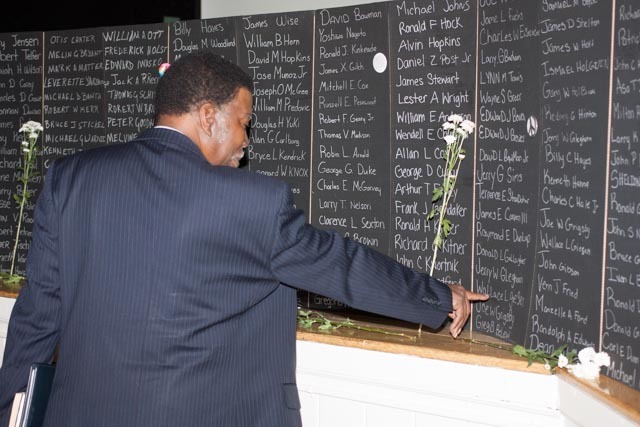 One veteran told me that by speaking with me about his military service, he felt empowered to turn to his father, also a veteran, and forge a new bond on the basis of that shared experience. Mr. Sweat once indicated I played a role in his feeling welcomed home. I was and remain deeply honored by that remark. Turning to the subject of oral history, this project, this effort to hear with all parts of our system awake and alive to the sounds of truth, lies at the heart of the practice of oral history – my professional field. 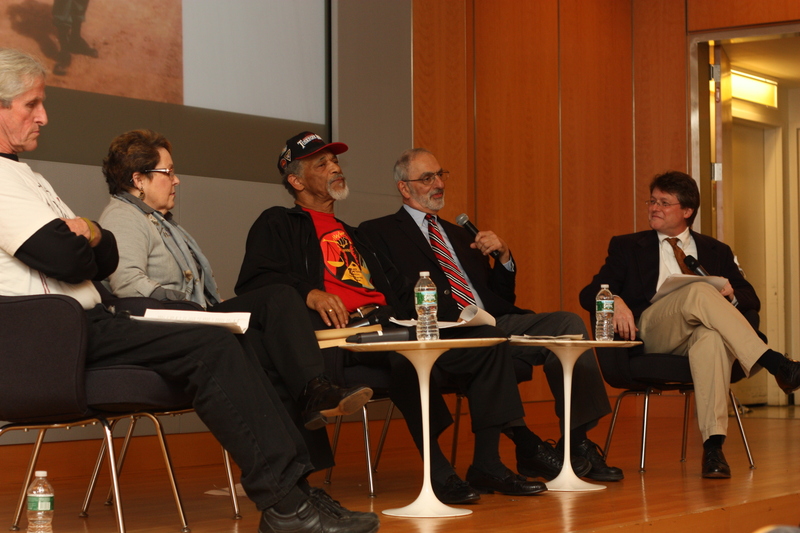 Allow me therefore to say a word about oral history, which forms the basis for tonight’s panel discussion. Oral history is something of a misnomer that can lead to confusion, but there is no better term around. It is sometimes called oral testimony, too, but that sounds like something that would occur in a court. Oral history is not the same as “history” as you know it from college classes and books that are based on documents created by people at the time events take place. To understand oral history and its aims, you have to put aside the empiricist notions of history that are in common circulation, in which there is a world of objective, knowable fact, and it is the historian’s job to simply find and record those facts. Academic history doesn’t really work like that in the first place, and oral history certainly does not. Like historical research as traditionally practiced in the academy, oral history is interested in what took place in the past, but is equally interested in what the events of the past mean now. In this way, it deals principally with the intersection of the present and the past, the way the past lives on in the present. It is about both the past and the present at the same time. It is an interdisciplinary field, and has much in common with sociology, psychology, anthropology, journalism, but also overlapping with history as more traditionally understood. Oral historians also deal with the archival record (I spend as much time in the archives as I do recording people) but we add to those accounts new ones, created retrospectively, via memory, with all of the faults and problems — and all of the rewards — that this will imply. We get at these memories and their meanings using the qualitative interview method that emphasizes participant’s perspectives. We follow an open-ended interview model, in which the researcher guides a narrator through his or her story. The data of oral history is the result of that collaborative exchange, usually recorded on audio or video, and then transcribed, shared and interpreted. Each of tonight’s panelists has engaged in that process, either with me or with the NYPL Outreach staff, and our discussion tonight will revolve around the recollections uncovered in the process. Oral history exists, in part, because for hundreds of years only the literate and powerful left historical records behind. This fact shapes the history that can be told about the past. Today, when most people, at least in the US, have a basic level of literacy, we are too busy to produce historical records about our lives. We don’t write letters anymore, we email, at best. Perhaps we text. And many times we just pick up the phone if we need to communicate something. For this reason oral history provides one means – perhaps the very best means – of capturing the intimate, private and subjective stories that are critical, but at the same time so often missing, from the historical record. Tonight is a celebration of the stories of the veterans of our wonderfully diverse city – only made possible by the practice of oral history. 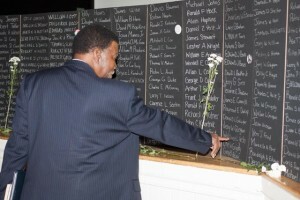 One result of our being together tonight, I hope, will be to encourage you, your families and friends to connect to the NYPL Outreach Services staff, and to help them record the histories of the veterans you know. Information on the NYPL project, and a sign up sheet, is available for you in the back of the room. 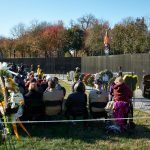 There have been various tellings of the history of Vietnam veterans and their lives after the war. In many studies they are understood either as examples of special interest activism as they crusade for a cause such as compensation for Agent Orange exposure, or as illustrations of “social problems” — men and women pathologically reshaped by their Vietnam experiences. Post-traumatic stress disorder plays a central role in this literature. Much of the time the words “veteran,” and “illness” are linked. 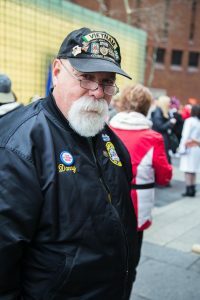 These issues have shaped the pubic perception of what it means to be a Vietnam veteran – indeed a veteran generally. No one in this room would challenge the reality of PTSD or traumatic brain injury, or Agent Orange-related illness, or the need for veteran’s activism, but the reduction of the veteran’s experiences to these themes is profoundly misleading, and in my view, unfair. So, tonight we will hear about PTSD, undoubtedly, and about illness and suffering, but also about recovery. We will hear about racism, but also about our potential to overcome racism. 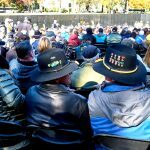 We will hear about the public reception of Vietnam veterans in the 1970s, but also about the pride veterans take in their service. 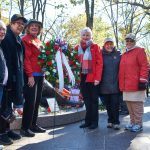 We will hear about a range of experiences, all of which were true, to one degree or another, for veterans from NYC, and the nation generally. If we listen to these men and women and what they have to say, carefully and deeply, we can bear witness to their story, their truth, and the multiple meanings of Vietnam. Using what we learn, we can become faithful storytellers, altering perceptions of Vietnam and its veterans one by one, as we move through the world. Philip F. Napoli, director of the Veterans Oral History Project at Brooklyn College, speaks about Bringing It All Back Home, a new book drawing on in-depth oral history interviews he conducted with more than two hundred military veterans between 2004 and 2010. He will be joined by several of those featured in the book to to discuss their experiences both in Vietnam and as veterans after the war. LILAC’s long-time volunteer, Jimmy Bacolo, will be among those sharing memories of coming home.